The Sports Car Driving Association, LLC welcomes all driving enthusiasts to attend our events. In the interest of clarification we would like to outline the basic criteria that should be met in order to place you in the appropriate run group. We make every effort to ensure that drivers are placed in run groups with other drivers of comparable experience levels. This will ensure that run groups are balanced, safe and fun. This guideline is meant to serve as a tool to help you decide where you would fit in best within our organization. Drivers may move to a faster or slower run group as appropriate. NOVICE is also known as the Green Run Group. INTERMEDIATE 1 is also known as the Blue Run Group. INTERMEDIATE 2 is also known as the White Run Group. ADVANCED is also known as the Red Run Group. The Novice run group is designed for the driving enthusiast that has limited or no prior track experience. This student may have previously completed in a few track events, but this is not required. Many of the students in the Novice run group will have never been to the track. Learning the fundamentals of performance driving, with a strong emphasis placed on learning the proper “line” around the track are the top priorities for the Novice student. Typically, the Novice student will be participating in his or her street car – and these cars are usually in stock or slightly modified configuration. If you are just starting out with performance track driving, then the most vital element that will help you become a better driver is getting track time, under the observation of our highly qualified SCDA instructors. Spending thousands of dollars on aftermarket “go-fast” parts for your car (such as racing tires, aftermarket suspension components and engine enhancements) is not as important as getting your street car out to the track and getting seat time! Dropping a Wheel and Spins, What to do. We will look at some in-car video footage and will provide a track specific PowerPoint presentation – answering all questions that Novice drivers typically have. For reference purposes, if you run with the BMW Club in group 4 or 3, then you would typically be in the Novice SCDA run group. If you have run with the Porsche Club, in the Green or Yellow group, then we would want to start you out in the Novice Run Group. Common Novice Run Group Cars may include : VW GTI, Nissan 350Z, Ford Mustang, BMW 3 series, Mazda Miata, Honda S2000, Subaru WRX and the like. The Intermediate run group is the home for driving enthusiasts with prior on-track driving experience. The Intermediate student will have a basic understanding of vehicle dynamics, as well as an understanding of line theory. This student is working on improving his or her driving through the most significant commodity that we can offer – track time. We encourage Intermediate drivers to ride with an instructor, at least for the first session. Even a person with prior track experience can learn the nuances of going faster from our SCDA Instructor pool. Once the Instructor is comfortable with the driver’s skill level then the transition to driving Solo will take place. The Intermediate student’s car, as a general rule, may have a few more performance modifications than the average Novice student cars, but again, this is not required. A few of the Intermediate level drivers will have made the transition from street tires to R Compound track tires. Some of the Intermediate drivers will have a fair amount of prior on-track experience, but it might be the first time that this experienced driver has visited a new race track. Track specific tips will be provided to Intermediate students during the classroom session. Intermediate Run Group cars may include : Porsche 911, Mitsubishi Lancer Evolution, BMW M3, Ferrari 430, Mercedes Benz AMG, Corvette, etc. We emphasize incremental steps to our Intermediate students, in their quest to gradually find an increased amount of speed and overall comfort level. Be it at Lime Rock Park, Watkins Glen International, New Hampshire Motor Speedway or any of the other great tracks we visit, quality track time with the Sports Car Driving Association is the key to being a smoother and faster driver. For cross referencing purposes, an SCDA Intermediate student would be a Group 3 or Group 2 BMW CCA Drivers Ed student or a Porsche Club Yellow or White run group driver. Intermediate 2 is the perfect run group for experienced track drivers who are comfortable driving solo but not sure if they are ready for the speed of the Advanced group. The Intermediate 2 driver will have a thorough understanding of vehicle dynamics, the driving-line theory and passing etiquette. The Intermediate 2 student is spending more track time driving closer to the dynamic limits of their car and fine tuning their car and driving skills. In the Intermediate 2 group drivers will find a tighter spread of performance on track so there will be less passing and more similar-speed cars to run close to. Not all drivers choose to move up to the Advanced run group but Intermediate 2 drivers who do wish to advance will need to show safe and skilled driving, situational awareness and be approved by one of our Instructors. The Advanced run group is ideal for the seasoned track driver. This driver will have had considerable prior experience with performance driving, and a portion of the Advanced run group students may have prior competition experience. Advanced is a Solo run group – these drivers do not need an instructor in their car and may not drive with a passenger other than an instructor. For reference purposes, this would be where BMW CCA Run Group 2 or Run Group 1 or Porsche Club Black Run Group drivers would feel most comfortable. Advanced vehicle dynamics, weight transfer and optimization. An Advanced run group driver will possess a solid understanding of vehicle dynamics, will be proficient at heel and toe downshifting, and will exhibit the ability to control his or her car in a high speed environment without dropping wheels or spinning their car. A large portion of Advanced Run Group drivers will have cars that are heavily modified for track driving and a portion of Advanced run group cars will be dedicated track cars. 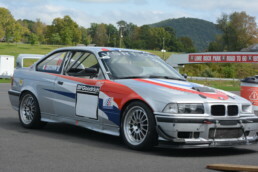 Advanced Run Group cars may include: BMW or PCA cars set up to Club Racing specs, SVRA or similar vintage sedans, BMW M cars, Improved Touring cars, Mazda RX7 Turbo, or other high performance automobiles. At the SCDA, LLC, the most important aspect of the day, regardless of which run group you are assigned to, is driving within your and your cars ability level, and keeping the day safe and fun! The above Run Group descriptions will hopefully help you decide where you would fit in best!